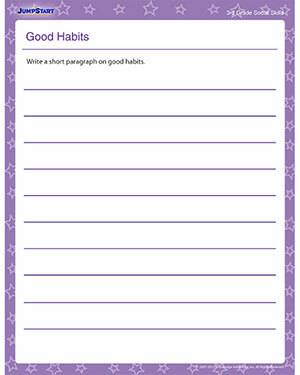 Writing an essay on good habits is an essential 3rd grade social skills worksheet that all kids must download and attempt after learning important topics in social skills. The social skill printable doesn’t bind the kids’ imagination and provides them with enough scope to explore other good habits that haven’t been taught in the class. Encourage them to think freely, out of the text book and come up with interesting good habits that they think are desirable in their friends and other pals.